Much research on peer victimization (also known as “bullying”) points to the need to understand the phenomenon’s group nature within school settings. A large body of literature has clearly shown that students who experience peer victimization also exhibit a host of negative outcomes in the psychological, social, physical, and educational domains. Surprisingly, however, little research has been conducted regarding what students should do when they get picked on (i.e., what coping strategies work best). In addition, virtually no work has considered the extent to which the social context may be associated with whether a student chooses a given response and whether or not that response works. The purpose of this research is to identify key peer group contextual factors that can be targeted to ameliorate the psychological consequences of daily peer victimization. The study proposes inquiry into two specific areas: (a) Do social environments (e.g., friendship groups and the presence of bystanders) predict sixth- grade students’ coping responses? and (b) How do coping strategies and social environments interact to predict well-being in the face of daily peer victimization experiences? The planned study will utilize daily- report methodology over 2 weeks to assess the social contextual factors associated with peer victimization experiences, effective coping responses, and current well-being. Our ethnically diverse sample will consist of approximately 960 sixth-grade students from African American, Asian American, Latino, and Caucasian backgrounds within three communities in Wisconsin, California, and Oregon. April 18, 2019 - Congrats to Lyndsey! She was just awarded the 2019 Kosuna Doctoral Fellow award. This award is for outstanding performance as a PhD student in the Department of Nutrition and her potential as a future leader. April 12, 2019 - Congrats to Jakeem for being awarded at UC Davis Graduate Studies Dissertation Award! April 11, 2019 - Congrats to Emily—she was just awarded the Human Development Outstanding Senior Award, which will be presented in an award ceremony in May! April 10, 2019 - Carolyn’s paper was just picked up by Food Network. March 15, 2019 - Jackie was just accepted to the NYU QUEST summer research program AND was offered admission into the SDSU Psychology masters program! March 8, 2019 - Congrats to Dr. Aubrey Uresti for filing her dissertation! March 6, 2019 - Congrats to Dr. Natalie de Guzman for filing her dissertation! March 6, 2019 - Congrats to Jackie, Elise, and Emily for having the research proposals accepted for the undergraduate research conference at UC Davis. They will be presenting their work in April (stay tuned….). February 26, 2019 - Congrats to Emily for being nominated for several outstanding graduating senior awards from the College of Ag and Environmental Sciences! February 25, 2019 - Congrats to Jackie for being awarded an undergrad research fellowship to present her work at SRCD! January 29, 2019 - Congrats to Natalie for passing her dissertation defense! Taylor, J. C., Sutter, C., Ontai, L. L., Nishina, A., & Zidenberg-Cherr, S. (In press). Comparisons of school and home-packed lunches for fruit and vegetable dietary behaviors among school-aged youth. Public Health Nutrition. December 20, 2018 - Great news! SEVEN proposals from our lab were accepted for presentation at SRCD in Baltimore in March. Updated titles and date/times will be posted when they become available to us. October 19, 2018 - Congratulations to Jakeem for successfully passing his Qualifying Exam with committee members who were impressed with the quality of the work! September 2018 - CONGRATS to Lyndsey who just received a prestigious Food and Agricultural Sciences National Needs Graduate Fellowship from the USDA National Institute of Food and Agriculture! August 1, 2018 - Melissa Witkow and I are co-guest editing a Special Issue on Biracial, Multiracial, and Multiethnic Youth for the Journal of Early Adolescence. Manuscripts are due December 15, 2018. More info here. July 1, 2018 - Welcome to Tseng Vang, an incoming Human Development PhD student who is sitting in on lab meetings. June 15, 2018 - Congrats to research assistants Candisse, Krystal, Piter, and Veronica on their graduation!! May 23, 2018 - CONGRATS to Dr. Jennifer Taylor for filing her dissertation! May 17, 2018 - Jennifer just accepted a postdoc at UC San Diego, a joint position between Center for Wireless & Population Health Systems and the Design Lab! Congrats!! 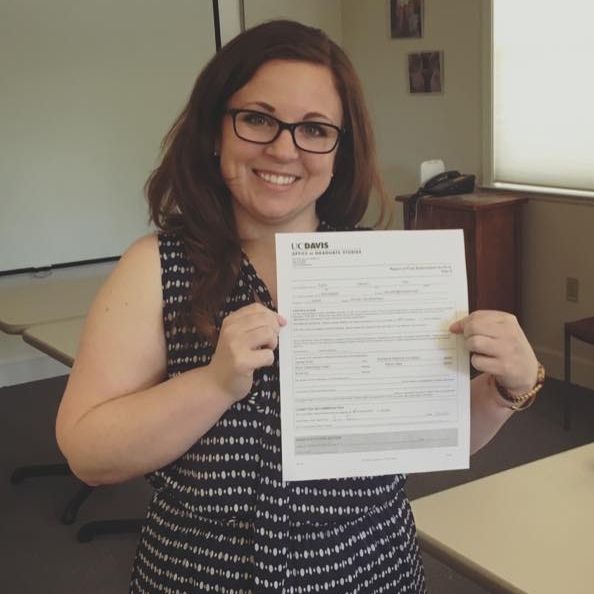 May 1, 2018 - Congrats to Alysha for accepting a job with United Way! They are so lucky to be gaining her as a colleague. May 1, 2018 - a belated congrats to Veronica for receiving an UC Davis undergrad travel award to present her poster at SRA! April 25, 2018 - co-authored publication with Luis just got accepted for publication in JRA. Nishina, A., & Parra, L. A. (In Press). Discrepancies between retrospective and actual self-reports of peer victimization 6 years earlier. Journal of Research on Adolescence. April 11, 2018 - EIGHT lab members will be presenting at SRA in Minneapolis this year. We are also currently recruiting for a postdoc. March 28, 2018 - Congrats to Luis for being awarded a Ford Foundation Dissertation Fellowship!! March 21, 2018 - Congrats to Luis for just being awarded a Dissertation Year Fellowship from UC Davis! February 22, 2018 - Congrats to Shannon for just being awarded the Orville Thompson Fellowship!! January 21, 2018 - The Peer Relations Lab will be attending The Society for Research on Adolescence Biennial Meeting from April 12-14 in Minneapolis, MN. The schedule for the ten presentations that members of the lab will be participating in can be found here! January 20, 2018 - CONGRATS to former undergrad research assistant in the lab, Adaurennaya "Ada" Chidinma Onyewuenyi, who just got a tenure track faculty position at The College of New Jersey in the Dept of Psychology!! December 7, 2017 - Jennifer is giving an invited talk at the UC Office of the President (UCOP) Nutrition Policy Institute today. December 7, 2017 - Alysha is giving an invited talk at the UC Davis Developmental Forum today. October 16, 2017/November 7, 2017 - The cross-ethnic lunchtime peer interactions paper was just covered by University of Wisconsin, Madison media. September 11, 2017 - The cross-ethnic lunchtime peer interactions paper in Journal of Youth and Adolescence was just covered by UC Davis media. August 31, 2017 - Jakeem says, "Look at all those papers in press. In-press-ive!" August 30, 2017 - the following paper was just accepted for publication in Appetite: Taylor, J., Sutter, C., Ontai, L., Nishina, A., & Zidenberg-Cherr, S. (in press). Feasibility and reliability of digital imaging for estimating food selection and consumption from students’ packed lunches. Appetite. August 30, 2017 - The following paper was just accepted for publication in the Journal of Vocational Behavior: Ramirez Hall, A., Nishina, A, & Lewis, J. (In press). Discrimination, friendship group diversity, and STEM-related outcomes for ethnic minority college students. Journal of Vocational Behavior. August 7, 2017 - Hooray! Congratulations to Lyndsey for passing her preliminary exam! July 27, 2017 - The following paper was just accepted for publication in the Journal of Family Theory and Review: de Guzman, N. S., & Nishina, A. (in press). 50 years of Loving: Interracial romantic relationships and recommendations for future research. Journal of Family Theory and Review. July 18, 2017 - The following paper was just accepted for publication in the Journal of Youth and Adolescence: Nishina, A., Bellmore, A., Witkow, M. R., Nylund-Gibson, K., & Graham, S. (in press). Mismatches in self-reported and meta-perceived ethnic identification in high school, Journal of Youth and Adolescence. July 10, 2017 - In collaboration with co-PIs Amy Bellmore (University of Wisconsin, Madison) & Melissa Witkow (Willamette University), Dr. Nishina was just awarded a 4-year grant from the Institute of Education Sciences, funded by the US Department of Education! July 6, 2017 - Dr. CAROLYN SUTTER officially filed her dissertation paperwork. Wonderful! June 28, 2017 - Congratulations to Aubrey! She was just awarded a 2017-2018 Dissertation Fellowship from the UC Davis Graduate Group in Education. June 18, 2017 - Congratulations to Dana Conlin on her graduation from UC Davis. Dana will be attending a PhD program at the University of North Carolina, Greensboro, where she will study how to improve the school experiences of youth. June 2017 - Jennifer and Carolyn presented research from the Parents-to-Peers study at the International Society of Behavioral Nutrition and Physical Activity (ISBNPA), Victoria, Canada. June 5, 2017 - Congratulations to Alysha -- her paper on how daily payments improve completion rates in online daily report studies. Ramirez Hall, A., & Nishina, A. (in press). Daily compensation can improve college students’ participation and retention rates in daily report studies. Emerging Adulthood. May 31, 2017 - Congratulations to Jakeem for being awarded a 2017 Human Development Graduate Group Merit Fellowship to carry out his research! May 26, 2017 - Congratulations to Luis for just passing his Qualifying Exam! May 19, 2017 - Congrats to Luis who just received an NSF GROW award to collaborate with researchers in the Netherlands! May 18, 2017 - CONGRATULATIONS to Jakeem A. Lewis for receiving his MS in Child Development today!!! May 16, 2017 - Congratulations to Jakeem and co-authors. His paper on how cross-ethnic lunchtime interactions predict adolescents' GPA and teachers' expectations of educational attainment was just accepted for publication. Lewis, J. A., Nishina, A., Ramirez Hall, A. N., Cain, S., Bellmore, A., & Witkow, M. R. (in press). Early adolescents’ peer experiences with ethnic diversity in middle school: Implications for academic outcomes. Journal of Youth and Adolescence. May 5, 2017 - Lab member Alysha just gave an invited talk at for the School of Behavioral and Brain Sciences at the University of Texas, Dallas! April 28, 2017 - Lab members Dana, Eva, and Veronica will each be presenting their research at the undergraduate research conference at UC Davis! April 27, 2017 - Lab member Alysha will be presenting her research in a paper symposium at WPA in Sacramento, CA. April 6-8, 2017 - Lab members Alysha, Carolyn, Jakeem, and Krista will present their research at SRCD in Austin, TX. March 13, 2017 - Congratulations to Skye for passing her qualifying exam! March 1, 2017 - Congratulations to Carolyn for accepting a postdoc position at University of Illinois, Urbana-Champaign! February 2017 - Congratulations to Jakeem for being chosen as a Millennium Scholar for SRCD 2017! February 2017 - Congratulations to Alysha for being chosen as a Millennium Scholar Mentor for SRCD 2017!